The mission of the Mordecai Land Trust (MLT) is to protect the ecologically valuable flora and fauna species on Mordecai Island. This includes stopping shoreline loss due to erosion from wind and nearby boat wakes. The southwestern corner has been most vulnerable due to fetch and its closeness to intracoastal vessel wakes. Conventional technologies using coir fiber biologs were first tried. Their rigid anchoring system failed due to the poor soil conditions and destructive wave vibrations from the bay. Undeterred, the MLT tried again and succeeded in 2010 with a breakwater using polypropylene geotextile tubes filled with 1000 tons of sand. Integral with their permit, the MLT is responsible for the maintenance of the breakwater, what the Army Corps of Engineers refers to as “maintenance of a legally permitted structure”. The tubes attenuate wave forces and accrete sand and sediment behind them, in time building the island section back to its 1977 tidal boundaries. The ideal maintenance program is to let Mother Nature heal itself. It is not only cost effective; it is one of the guiding concepts in the design of Living Shorelines. Protecting the tubes with a colony of living organisms that can withstand the forces of nature and boating damage and which can heal itself is insurance against costly repairs. Doing it with a natural covering of shellfish and marine biota that grows with sea level rise addresses the spirit and goals of sustainability. This is the definition of a Living Breakwater. It is New Jersey’s relative to a tropical reef which performs many beneficial functions, not the least of which is attenuating the force of waves. It’s nature’s resilient way of protecting an adjacent beach from erosion. A Living Breakwater is an integral component of a Living Shoreline. A combination of oysters and ribbed mussels native to Barnegat Bay has been selected as a first choice cost effective solution. Oysters grow to a finite elevation based on climatic conditions. However ribbed mussels grow higher than oysters due to their unique air-gaping capability when the tide recedes. They even grow on top of the tidal salt marsh. For our purposes in protecting the geotubes we intend to ultimately use the oysters as a subtidal foundation and grow ribbed mussels on top of them to their maximum height. 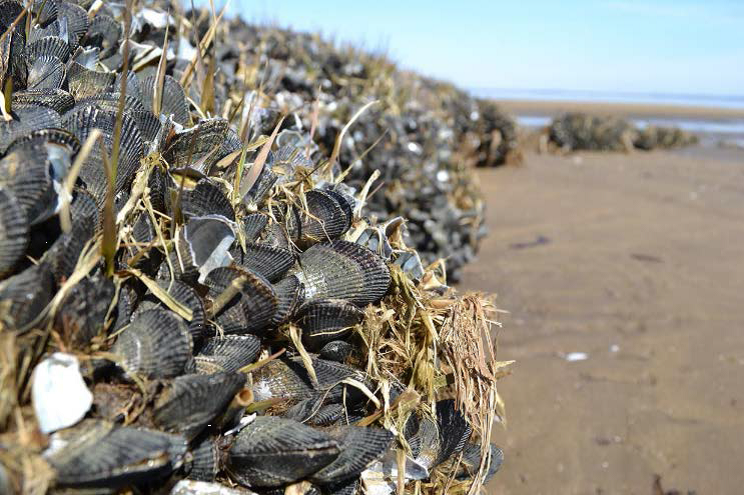 The challenge is that although ribbed mussels have been protecting marshlands from erosion for eons, they have never been farmed by man to do this. For the past three years the MLT, and our partners at ReClam the Bay have been experimenting with oysters and ribbed mussels at our local upwellers and at the geotubes. We have been evaluating the performance of live individual oysters, bagged oyster shells, and bagged oyster spat on shells at various locations around the geotubes and anchor tubes. We also harvested individual ribbed mussels and have been observing their attachment capabilities with substrates. Transplanting ribbed mussels from existing colonies in the volumes required to cover 600 feet of geotube surface is impractical from ecological and material handling standpoints. Therefore our research is directed toward developing lab spawning and remote setting techniques. This spring and summer we plan to continue evaluating ribbed mussels and oysters for suitability as a structural component of our Living Breakwater project. We expect to carry out these pilot tests at the Long Beach Island Foundation (LBIF) laboratory facilities, the adjacent LBIF tidal salt marshes, the various ReClam the Bay (RCTB) upwellers, and at strategic points on the geotubes themselves. This year our ribbed mussels will come in two forms: clumps and eyed larvae. The clumps can be found nearby. 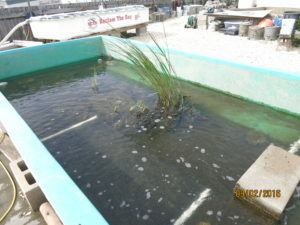 Initially, clumps will be relayed and installed in upweller tanks or test facilities for study. Data on elevation growth, survivability, substrate adaptability, attachment strength, spawning compatibility, etc. are some of the basic data we’ll seek. Before they can be relayed, we will survey their location and determine timing and methods of relaying, transporting, storing and nurturing them. Tides and weather dictate scheduling this work. A timetable would span thru the summer months. Much of the testing program schedule will be dependent on temperature and spawning times. Ribbed mussel larvae will be available from the Rutgers Aquaculture Innovation Center in late June/ early August. Ideal larval temperature is around 28 degrees Celsius which could complicate timing. 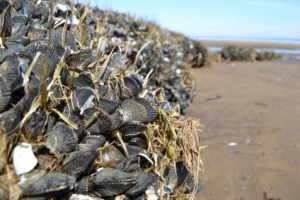 Since bagged shell will be used as a foundation for the ribbed mussels, they will be installed at the tubes beforehand. Alternately, various substrate materials will be evaluated in the upwellers at the Coast Guard Station and Little Egg Harbor Yacht Club. One expeditious approach has always been to attach the bivalve colonies onto the geotube surface itself. We initially tried this with oysters and failed. However the attachment mechanisms that oysters and ribbed mussels have are completely different. Ribbed mussels attach to oyster and clam shell with byssal threads. We would repeat testing multiple substrates in the upwellers as in the past, or the Foundation lab. If spat setting was successful, we’d continue with pilot testing on the tubes. I’m happy to say that we’ve recently succeeded in attaching ribbed mussel seed to oyster and ribbed mussel shell as well as geotube material in our upwellers. Now we hope to grow them to maturity and test their byssal strength in our lab during the coming months. Over the past 5 years an intertidal land bridge has been established between the tubes and island. We intend to plant clumps of ribbed mussels and Spartina together to prove the symbiotic relationship between the two species cited in the literature. The desired goal is that sediment would accrete faster and speed up island growth toward the tubes.